Policies create the foundation of an organization’s compliance program. They ensure employees have clear communication around behavior expectations and a consistent approach to critical tasks. Is your policy management process strong enough to support the critical elements of an effective compliance program? Over 1,200 E&C professionals, across multiple industries, weighed in about their approach to policy and procedure management. What are organizations doing to be more efficient about managing and distributing policies? What are the key challenges faced by policy management programs? How do organizations ensure employees understand and adhere to policies? How are organizations measuring program results? Here’s a sneak peak of the report! Organizations are prioritizing efforts towards ensuring employees are aware of policies and regulations they must follow. This shows that companies are still struggling to get their messages of ethics and compliance out and internalized by employees. 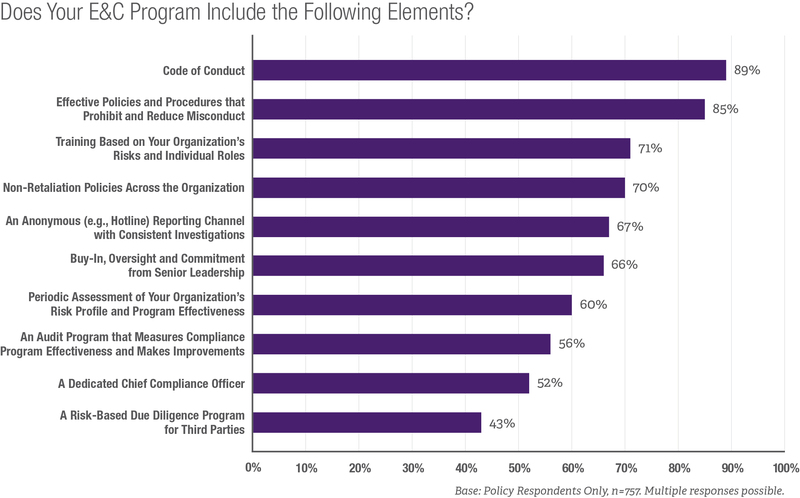 The top elements included in almost every ethics & compliance program are policy related. However, employees may not be aware of these policies, as evidenced by other responses stating that training employees on policies is a primary challenge for most programs. Case closure times continue to climb year over year. From a median of 32 days in 2011 to 46 days in 2015, case closure times continue to increase dramatically. Could this be an indicator that organizations do not have sufficient resources to address the volume of reports they are now consistently receiving? Find out what our experts think in the report. Download the full report to read additional analysis and advice on improving your program.